‘Jean Shaw was a council nominated town trustee for ten years from 1969-79. She was the second female to be nominated to serve, the first being Mrs P. Pomeroy, 1962-3. Jean can recall her time as a trustee in the early 1970s. The community minibus service for the benefit of the elderly and disabled had been introduced by Geoffrey Searles in 1970 – he raised the funds that were used to purchase a white Ford van converted for the purpose. Not only was Jean a regular volunteer driver, she was also responsible for hosing down the exterior and cleaning the interior of the vehicle – weekly tasks that were performed on the drive outside her house. There was no bus garage; it was parked on her premises when not in use. The first volunteer drivers were all town trustees. They issued the dockets to the passengers and handled and accounted for the cash that came in. There was also a considerable amount of committee work involved as the trustees were determined to involve their community. The original minibus group consisted not only of two town trustees (of which Jean was one) but also two from the Alresford & District Care Group, two from the over 60s club and another two from the Parochial Church Committee. There was a new bus service to be advertised, pick-up journeys to be planned, venues to be assessed for suitability, driving rotas to be organised and vehicle maintenance to be scheduled. Jean was responsible for most of these tasks for ten years. Her legacy is that the service she created still exists today. Jackie Porter, the Hampshire County Councillor, wrote about an interesting local project in the Alresford Forum this March. It concerns the Morn Hill Camp, which was set up in 1914 as an assembly camp for soldiers on their way to France to fight in World War I, and also for the return trip home. Tony Dowland had contacted Jackie to see if it would be possible to create a memorial for these soldiers. The camp was a large one, for up to 50,000 soldiers. They arrived there in the process of transit to France, and came through again on their return trip home. Unfortunately too few did return from the front, and tragically, hundreds died of Spanish Flu before they could reach their families. In 1918, a railway was built to carry supplies up to the Avington copse area at the west of the site, but it was quickly dismantled after the war ended. After some preparation, a number of interested parties held a Morn Hill Memorial launch event at the Holiday Inn, with the plan to work out how to achieve a memorial by 2014, the 100th anniversary of the setting up of the camp. Support was offered by Brigadier David Harrison, one of the Deputy Lieutenants of Hampshire, who has agreed to be Chairman of the group, the broadcaster Dan Snow, and our local MP, Steve Brine. This is where people with Alresford memories come in! Do you or your family have any recollections of the camp? Do you have any knowledge, photographs etc of this part of the military history of the area? Perhaps your family history includes receiving the soldiers or seeing the railway? Please let Jackie know, on jackie.porter@hants.gov.uk! John Arlott was a well known journalist and cricket commentator for the BBC’s Test Match Special. His voice was well-known to most people who listened to accounts of cricket matches: he was a popular commentator partly because of his gift for poetic phraseology, in his descriptions of events. He lived in Alresford for 20 years, from 1961 to 1981, before retiring, when he went to live on Alderney in the Channel Islands, where he died in 1991. The house he lived in was the old Sun Inn, on the corner of Sun Lane and East Street. In fact John was also well known as a wine connoisseur, and he wrote a wine column for the Guardian newspaper. On his retirement his well stocked cellar was auctioned at Sotheby’s. It was somehow appropriate that he should have lived at the Sun Inn, which was said to have had a reputation for being the destination of a lot of smuggled wine, kept in their cellars, many years before. Actually, writing this I discovered that Arlott was also a football correspondent for the Guardian as well, and at his own request he had planned to travel with the Manchester United team to report on the match between them and Red Star Belgrade, a European Cup match in Yugoslavia. At the last minute their chief soccer correspondent, Donny Davies, pulled rank and decided to go instead. The aircraft bringing back the team, officials and press crashed in what became known as the Munich Air Disaster, and Davies was one of the fatalities. 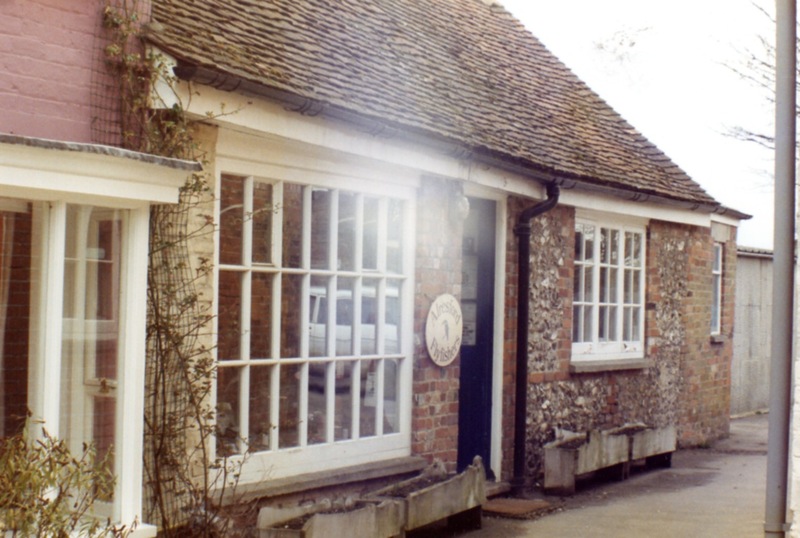 In Alresford, at a ceremony on 21 June 2009, a plaque commemorating John Arlott’s 20 years of living at the Old Sun was unveiled by his sons Tim and Robert Arlott. The plaque was funded by The Cricket Society and the guest of honour, who cut the ceremonial cake, was his oldest friend, Leo Harrison, (then aged 87). This was followed by an inaugural local village cricket competition, with participating teams from Tichborne, Old Alresford, Ropley and Cheriton, for the (quoted as) annual John Arlott Cup. The plaque can be seen on the side of the Old Sun building. For more info and a photo of John Arlott opening the Cheriton cricket pavilion, see the Cheriton Cricket Club website http://www.cheritoncc.com. “Alresford is, even for Hampshire, an unusually hand-some small town, T-shaped, ancient, full of character and antique shops, riddled with wood-worm, surrounded by watercress and patrolled by trout. Its main street is wide enough for a coach and four to turn – as they used to do – and its long history is reflected in its houses, varied, mature, airy and easy to live in. For the visitor it has many smallish, personal and original shops – one with a splendid trove of antiquarian books – and ample refreshment. It used to have eight pubs and a brewery; now it dispenses the adequate hospitality of five, a wine bar, a hotel and a couple of restaurants. For 2012 we have gone down to three pubs and two hotels in the town centre, but at least we do have a brewery again! A later story will discover where the hidden pubs in Alresford are. Submitted by Nick Denbow, using quotations from Wikipedia and the OXFAM book “A Taste of Alresford” by Sally March. Another question for young and older residents alike. There was once a TV comedy programme made using scenes filmed in Alresford, featuring a bungalow. Do you know where the bungalow was? More relevant perhaps is what was the TV programme that used this as a scene? I believe it was an episode of a series like “Some Mothers Do have ‘Em”, maybe featuring Michael Crawford, where he does some DIY on this bungalow, and basically it is demolished, and the whole building collapses. Does anyone know what the programme was actually called, and who featured in it? Has anyone got any photos of the bungalow before and after? It would be nice to have copies for the town museum! Better still would be a copy of the TV programme! A project for young and older alike! Do you know where the garage was located in Broad Street? I believe this garage was once used in a film, and to make it look more like a high-class country town car sales business, several new signs were added at the front of the building. In 2012 one of these signs still exists in Alresford, can you identify where it is? But more interesting perhaps, is the question about what was the name of the film or TV series or whatever that used the garage as a back-drop. A clue might be that filming is always made clear through a good lens.